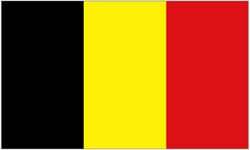 Belgica is a nation led by King Naruu on the continent of Africa. Belgica's government is a Social Democracy with very libertarian social policies. Economically, Belgica favors far left wing policies. The official currency of Belgica is the Euro. At 1,213 days old, Belgica is an ancient nation. Belgica has a population of 7,804,918 and a land area of 81,360.00 sq. miles. This gives it a national average population density of 95.93. Pollution in the nation is evident. The citizens' faith in the government is completely depleted with an approval rating of 0%. 04/02 06:59 am - Belgica had war declared by Old Brittannic for the reason of "From Nova With Love 💕". 03/27 06:05 am - Belgica changed their Color Trade Bloc from Maroon to Blue. 03/17 05:16 pm - The embargo on Belgica placed by Sherifian Empire of Morocco has ended. 03/17 12:37 am - Belgica changed their Color Trade Bloc from Brown to Maroon. 03/17 12:29 am - Belgica applied to join the alliance Raven. 03/17 12:29 am - Belgica left the alliance Nova Riata. 02/04 06:47 pm - Belgica changed their Color Trade Bloc from Gray to Brown. 02/03 06:45 pm - Belgica was embargoed by The Bay Area. 01/31 12:06 pm - Belgica had war declared by Kingdom of Shadows for the reason of "Gib me all ur moneyz". 01/30 07:02 pm - Belgica had war declared by Zeal for the reason of "Healing my wounds". 01/23 12:46 am - Belgica had war declared by Principality of Odin for the reason of "It would appear that we are in a war with your good fellows". 01/22 03:22 pm - Belgica had war declared by NewRome for the reason of "Do you feel lucky, punk?". 01/22 02:42 pm - Belgica had war declared by Butwan for the reason of "Sock it!". 01/21 08:12 pm - Belgica changed their Color Trade Bloc from Gray to Brown.